Relax and let the Antigua Bay collection by C&F Enterprises sweep you away to the beach! 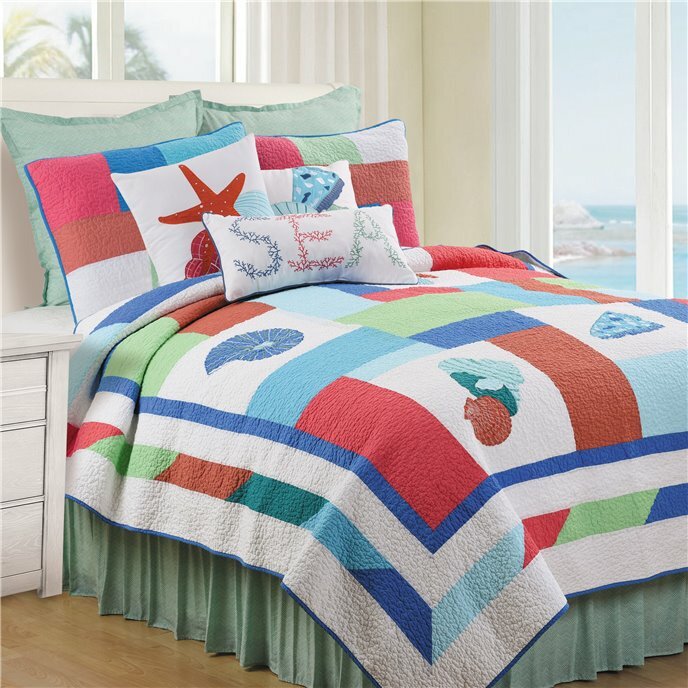 The color block quilt pops with bright coastal colors like pink, blue, and green. The quilted seashells give the ensemble an added touch of beach charm. The quilt reverses to a solid blue for an added styling option. Beautiful sea colored European shams and a ruffled bedskirt tie the look together. Mix and match the ocean themed throw pillows for your own custom look. Made by C&F Enterprises. Escape to the sea with the Antigua Bay quilt set. A block pattern of a colorful coastal palette of pink, orange, green and blue with applied shell designs on a white background. Reverse to a solid blue for additional styling options. Crafted of cotton this quilt set is machine washable for easy care. 1 Twin Quilt and 1 Standard Sham, Measurements: Quilt 64" x 86"; Sham 20" x 26" , Hand Guided Cable Stitching, Coordinating Accent Pillows, Euro Shams and Bed Skirt Available Separately, Face 100% Cotton, Fill Material Polyester/Cotton Blend, Machine Wash Cold, Line Dry, Imported. Made by C&F Enterprises. Escape to the sea with the Antigua Bay quilt set. A block pattern of a colorful coastal palette of pink, orange, green and blue with applied shell designs on a white background. Reverse to a solid blue for additional styling options. Crafted of cotton this quilt set is machine washable for easy care. 1 F/Q Quilt and 2 Standard Shams, Measurements: Quilt 90" x 92"; Sham 20" x 26" , Hand Guided Cable Stitching, Coordinating Accent Pillows, Euro Shams and Bed Skirt Available Separately, Face 100% Cotton, Fill Material Polyester/Cotton Blend, Machine Wash Cold, Line Dry, Imported. Made by C&F Enterprises. Escape to the sea with the Antigua Bay quilt set. A block pattern of a colorful coastal palette of pink, orange, green and blue with applied shell designs on a white background. Reverse to a solid blue for additional styling options. Crafted of cotton this quilt set is machine washable for easy care. 1 King Quilt and 2 King Shams, Measurements: Quilt 108" x 92"; Sham 20" x 36" , Hand Guided Cable Stitching, Coordinating Accent Pillows, Euro Shams and Bed Skirt Available Separately, Face 100% Cotton, Fill Material Polyester/Cotton Blend, Machine Wash Cold, Line Dry, Imported. Made by C&F Enterprises.